My musical journey began in what they called the swinging sixties when I started taking drum lessons from local drummer Arthur Brighton a friend of my dads who I remember seeing playing on one occasion during the late 1960'6 at the Cliff Hotel in Gorleston with organist Tony Graham. I myself went on to play with Tony Graham in the Grenfell Room of the Cliff Hotel during the early 1970's. After Arthur I then later went on to take drum lessons from well known drummer/bandleader Trevor Copeman who's band was resident at the Tower Ballroom in Great Yarmouth and the Samson and Hercules in Norwich throughout the 1960's and 1970's. The first band that I was invited to join was mainly a rehearsal band led by trumpet player Christopher Holmes who at the time lived just around the corner on Burgh Road in Gorleston. Christopher was taught by well known trumpet player the late Jackie Guard who I knew very well as we both at the time lived on Humberstone Road. Jackie was a wonderful musician who led his own band during the 1950's on Great Yarmouth's Britannia Pier and also played on the last ever british tour with Glen Miller And His Orchestra. Christopher was a fine player along with the rest of the band which was mainly a rehearsal band for the only gig I recall us playing was at a private function held at the Floral Hall in Gorleston. Our rehearsal space was at the Shrublands Youth and Adult Centre where we rehearsed in one of the old prefab style outbuildings situated to the side of the old Shrublands Farmhouse. I remained with the band for only a short time when I then found myself playing with a local country and western outfit The Cumberland Gap Trio for which I was recommended through my association with organist Fred Short. Fred who recommended me to the band was for many years the resident organist in the Coral Reef Bar on the Britannia Pier in Great Yarmouth throughout the 1970's. Country and western outfit The Cumberland Gap Trio was my first professional working band that included John Perrin originally from the north of England on lead guitar Neil Armstrong on lead vocals playing rhythm guitar along with myself on drums. We rehearsed in a small room above the Gorleston Social Club and occasionally played in the clubhouse below. On one occasion skiffle legend Lonnie Donegan's former drummer Nick Nichols who was living in the area at the time deputized for me on one of our regular Saturday night gigs at The Never Turn Back public house in Caister-on-sea. It was a venue I will always remember because of it's makeshift stage at the time for the want of a better word giving a whole new meaning to the expression stable consisted of a bunch of beer crates turned upside down covered over by an old carpet that had well seen better days. Priceless to say the least. Some years later I had the pleasure of backing another skiffle legend Chas McDevitt who along with Nancy Whiskey had a big hit on both sides of the Atlantic with Libba Cottens's Freight Train. 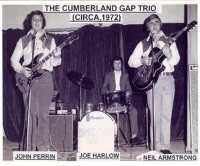 I had a wonderful time playing with John and Neil in The Cumberland Gap Trio but towards the end of the summer months in 1972 I decided to move on for pastures new. For a small seaside town Gorleston had an abundance of local venues back in the day where local musicians could play and entertain visitors and locals alike. Gorleston venues The Belle Vue Tavern, The Pier Hotel, The Ocean Room (formerly The Floral Hall,) The St Edmunds Hotel, The Cliff Hotel, The White Lion Hotel, The Cap and Gown public house and The Shrublands Community Centre these days known as Pub On The Shrubs were just a few back in the day. Some of those Gorleston venues pubs hotels local watering holes and the like are now sadly long gone while others still remain today. Wonderful times of days gone by. This page was added by Joseph Harlow on 28/11/2018.